I spoke to an agent today who told me, “I just need to get through more doors”. It’s something I hear every day. Because once you’re through the door, the rest is easy, right? So how do you actually get through more doors? 3. Getting valuation appointments from a ton of canvassing, at an average cost of £800 each. I’ve spent the last 12 years figuring out exactly what works, and doesn’t work, in estate agent marketing. 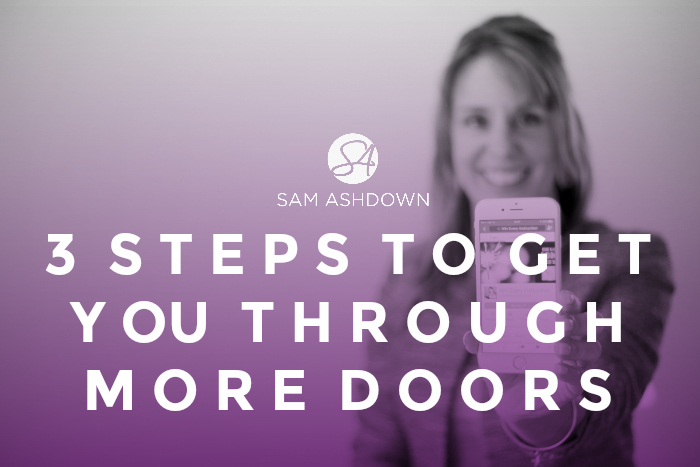 Over that time, I’ve tried just about everything, either myself, or via my clients, and I’ve created a unique marketing system to get you through more doors, every time. But before I tell you more about how I help agents like you, let me introduce you to Nancy. Nancy is an independent agency owner in Cardiff with a marketing challenge. She spends most of her marketing budget on canvassing, but is increasingly unhappy with the results – both in quantity and quality. The only people who respond Nancy’s leaflet are attracted by the ‘Sell your house for £995’ headline so if they do become clients, they are usually more trouble than they were worth. Tom and Claire were actually a bit like Nancy and her husband, and many of their friends. No coincidence there, as we do tend to attract clients like ourselves, in terms of demographics, life chapter and values. “Nancy, what do you do with canvassing leaflets and flyers?” I asked her. Turns out she hadn’t really thought it through. Then came the next question for Nancy; I asked her how she would approach a search for a professional service provider; say, a solicitor. She told me she would first go to family and friends, then social media, and possibly Yell reviews. “So you wouldn’t Google, ‘solicitor in Anytown’?” I asked. I agree. But that means that two of the avenues – or marketing channels – to attract the Tom and Claires of this green and pleasant land, are now not available to us. What kind of client magnet are you? The trouble is, many estate agents build their businesses based on advertising and marketing that attracts entirely the wrong kind of audience. If you plough all your marketing budget into getting found on Google and your latest, greatest leaflet design, you could be spending a ton of money on becoming a wrong-client magnet. So how can you target your ideal client? Market: first things first – who is your ideal client? Here are a couple of posts to read to work that one out: this one and this one. Once you’ve worked out who it is, it’s time for step two – Message – figure out what they want to know. Their biggest concerns may not be your valuation and fee (shock, horror), but may instead be more about timing and finding their next home. How can you address in your marketing the things that are keeping them awake at night? Finally, what Medium are you going to use to reach them? You need to know where they hang out (social media, email) and therefore the best way to reach them (for them, not you). MARKET > MESSAGE > MEDIUM – in that order. So how are you going to use this information to get you through more doors? Good news – I’d like to help you really take your marketing and instructions to the next level, by offering you a FREE 1-2-1 Marketing Planning call with me, personally. Just click here and take the first step to taking your business to the next level. BUT – I only have a handful of call spots left, so if you want one – click the link now and book your free call quick!